"Psst," said Marty L'Herault, waving a hand from inside the velvety dark curve of his horse-drawn buggy parked on the side of F Street. The setting sun had shellacked the fronts of the old-timey buildings around the plaza in gaudy gilded pinks, and the pigeons had all tucked in behind their spiny rain-gutter fortresses for the night. No rain. No gray. Big planets lining up with the half moon. Beauty and portent thick in the air. 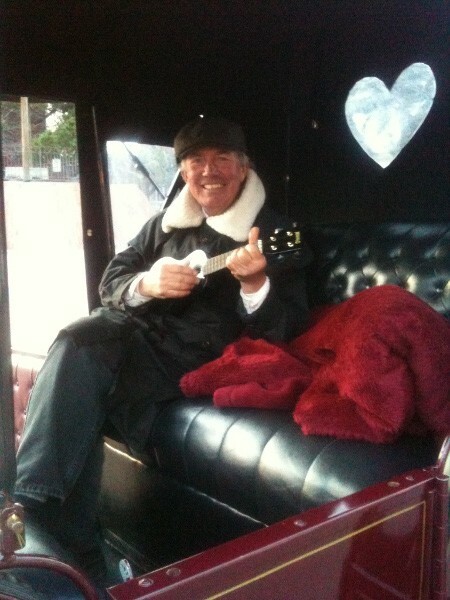 L'Herault cradled a shiny new black ukulele, a cheapy but a goodie, and plucked a few lines. "Check out this guy," he said, nodding at a young man in a gold ski hat standing in front of the jewelry store across the street. "He's been there all afternoon. 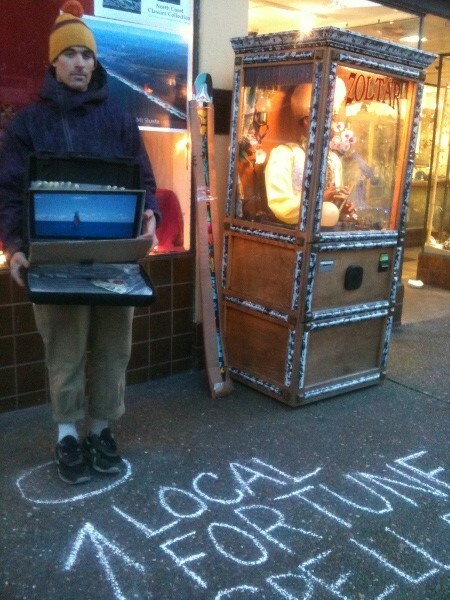 He's the buy-local fortune teller." L'Herault laughed. Tristan Bangs was only barely local, a transplant from Portland. He stood ramrod straight, knees and feet together, inside a tiny white circle he'd chalked on the sidewalk a few feet from the genie Zoltar sitting inside a lighted box. In front of his circle he'd chalked in huge letters "Local Fortune Speller." His outstretched arms supported a big old electric typewriter case, propped open. In rows of pockets on the inside of the lid he'd tucked little rolled up pieces of cash register paper with typed messages on them. In the bottom of the case were his earnings so far: a ten-buck coffee cash card, a dollar bill and some change. He glanced at Zoltar. "He charges dollars; I just want cents," Bangs said. "I even give them away." Sure, he'd zoomed in on Zoltar's game. But Zoltar got back at him. "When he speaks, he makes me laugh," Bangs said. "Every time." Which is bad, you know. A man offering fortunes should be somewhat serious. On cue, Zoltar dropped his favorite guilt-tripping come-on line: "I see you over there. Yes you. Come on over to Zoltar and let me tell you your fortune." Bangs grinned, then forced his mouth closed into a crooked line. He'd sold and given away about 50 fortunes in the past two days, first in Arcata and now here next to Zoltar. One lady, today, had been really grouchy when she'd got her fortune -- "positive experiences are something everyone can relate to" -- and she'd come back to rip on him about how crappy the world is. She asked if he really wanted to hear all that, and he said yeah, sure, lay it on me. "And then she started smiling," said Bangs. A woman came out of the jewelery shop, not smiling, unplugged Zoltar before he could sound off again, and rolled him into the shop for the night. Zoltarrrr! Come back out here. Let me give you my money and you tell me my fortune.